When you are busy developing your business and attracting new customers, don’t forget to keep in contact with your existing ones. 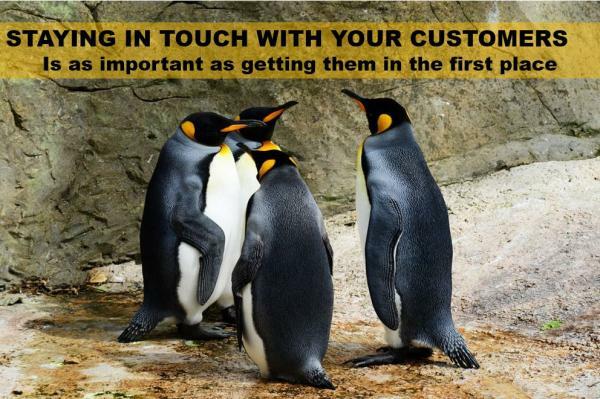 Don’t take your existing customers for granted – stay in touch with them and keep on their radar. There are lots of things you can do, and I find one of the best ways is to share something useful and helpful which is what I try to do in my weekly blog posts. Don’t just use your CRM for mailshots? How do you use your CRM? Make a note of important little things like what’s going on in their lives, their business, have they been nominated for any awards, when’s their birthday or their business anniversary? Listen to what customers tell you about their future business plans. Even if it is just an idea or concept, make a note of it and put something in the diary to remind you to pick up the phone and ask them how the new idea is shaping. Perhaps you can offer some help. Knowing each customer well puts you on the front foot. It shows you understand their business and they know how you can help or contribute. Most importantly, it shows you care. Thinking ahead and keeping in touch with your customers will go a long way to building a trusted, long-term relationship. You remembered them, they will remember you. Perhaps next time they get asked to recommend a business supplier, you will be the first person they think about. Know how your customers like to communicate, notice their style and choose a way to get in touch that works for them. You can read more about that in last week’s blog about the best communication style to use with your customer. Where do your customers hang out on social media? Find your customers on social media. They may be on Twitter, Instagram, What’s App, Facebook or Google. Find them, follow them and pay attention to what topics they are talking about, what events they are attending or any workshops they are hosting. You may discover they are moving to a new office, or have just secured a big new client. Don’t you just love it when someone takes the time and care to do something just for you? Here’s a great example. This week, one of my business friends told me how they received a unique thank message in the form of Thornton’s Alphabet Truffles chocolates. Isn’t that just a brilliant idea? I think it is certainly one website I will bookmark for the future. It does not have to be chocolate because what if you knew your customer did not like chocolate or was on a diet, or diabetic? You see, it is not just business information we need to know. What else can you do? You could see something that mirrors your customer’s personality and style. You will often hear me talking about lumpy mail. Thud! That is the sound of a whole pile of mail landing on your doormat. Which one will you open first? The brightly-coloured, lumpy one of course, because it looks more interesting and may have something nice inside. Remember, people pay the people they like first so how can you be that person somebody likes? The easiest way is to do something unexpected. Send a Thank You card, or a Birthday card. If you hear they are unwell, send them a Get-Well card. What do you do to be remembered and stay in touch with your customers?